We love bringing simple dishes to potlucks. Mostly because I always wait until the last minute to throw something together but I still want everyone to be like oh-my-gosh, this is AMAZING! So anyway, this easy dill pickle dip covers all your bases: it's easy, quick, cheap, and deeeeelicious! 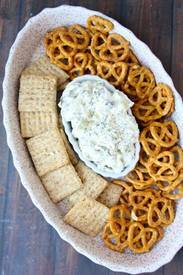 Bring the pickle dip to your next get together and you'll be the star of the party.